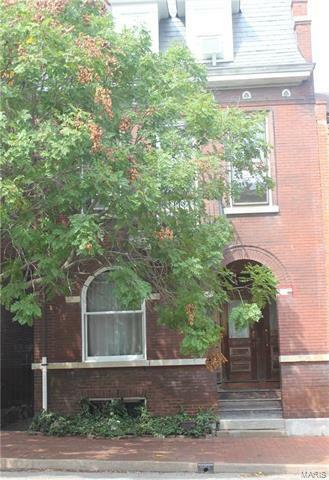 UNIQUE and TRENDY second floor unit in Soulard!! Fun space with historic charm, character and a spectacular floor plan. FIVE spacious rooms with original hardwood flooring throughout. Living room, dining room, separate bedroom with pocket door entrance, kitchen and full hallway bathroom. Historic touches include; pocket doors, THREE gorgeous tiled decorative fireplaces, built –in bookshelves, exposed brick, period woodwork, and nine foot ceiling. You will fall in love with the warmth, the exquisite light and the appeal. Large Eat-in kitchen with an abundance of counter space, cabinetry, appliances and pantry. NOTE full size gas stove will be provided. Kitchen walks out to a private wood deck with excellent views. Street parking ! Radiator heating and provided window units for cooling. Smaller pets allowed with a deposit and acceptable breed. Close to fabulous eateries, shopping. Fantastic Landlord looking for a fantastic tenant with excellent credit, verifiable job.